The Cumberland & Dumfriesshire Farmers Mart P.L.C. had forward 849 head at their Annual Ram Fair at Longtown on Wednesday 6th October 2010. The 590 Texel, Suffolk, Charollais and Crossbred rams were a quality show and size easily sold. The 323 Texel rams and ram lambs forward also included their Annual Show and Sale, kindly Sponsored by Trojan 4 x 4, Linstock, Carlisle. 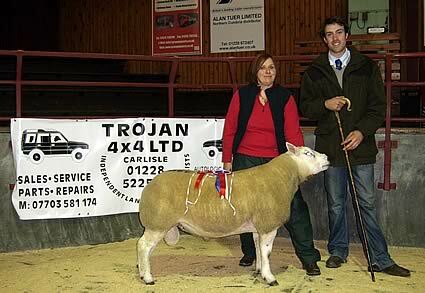 The show was ably judged by Mr David Douglas, Catslackburn, Yarrow who awarded The Championship to a Shearling ram from Annual consignors A. & H. Smith, Crumhaugh Hill, which realised £620, selling to Annandale Estates. 1st Prize and Champion – A. & H. Smith, Crumhaugh Hill to Annandale Estates. 2nd Prize and Reserve– Kirkton £1,000 to Rennie, Sydenham. 3rd Prize – Crumhaugh Hill £480 to Adderston Shiels. Ram lamb:- 1st Prize – Little Gala £260 to Mossband House. 2nd Prize – Little Gala £170 to Crossdykes. 3rd Prize – Harene £170 to Fergus Hill. Shearlings - £1,000 (x2), £950, £880 Kirkton, £700 Falla, £680 Uppercleugh, £580 Skelfhill, £550 Catslackburn. Ram lambs - £320 Uppercleugh, £300 (x2) Sandilands, £280 Uppercleugh, £260 Little Gala, £250 (x2) Raggetsyke. The 137 Suffolks forward were a great show for quality and sold well, short of buyers requirements. Shearlings to £540 Kilnfordcroft, £520 (x2), £510, £500 Guards. Ram lambs to £555, £500 Lands, £500 Archerbeck, £440, £420 (x3), £400 Lands. The 130 other breed rams forward saw only large well bred rams easily sold. Charollais shearlings to £400 Newton Cottage, £380, £360 Thackwood, £360 Blacksmiths. Charollais ram lambs to £420 The Kerr, £360, £340 Pates Hill, £320 Springfield. Suffolk x Beltex shearlings £440, £420, £380 Allanshaws, £360 Eskdale. Blue Texel ram lambs £260 Millside. Beltex shearlings £240 Newton Cottage, £220 Mouldy Hills, £200 Flex. Texel x Rouge shearlings £300 Dinwoodie Green. North Country Cheviot shearlings £230, £200 Whitcastles, £220, £200 North Synton. The Annual Show & Sale of Bluefaced Leicester Rams saw The Judge Mr J. Nicholson, The Old Police House award the Championship to the Shearling Ram shown by Messrs I. & G. Aitchison, The Side. This ram later realised £900 to Messrs Forster, The Nook. Shearling ram:- 1st Prize and Champion – Messrs I. & G. Aitchison, The Side. 2nd Prize – G.E. Carter & Son, Parcelstown. 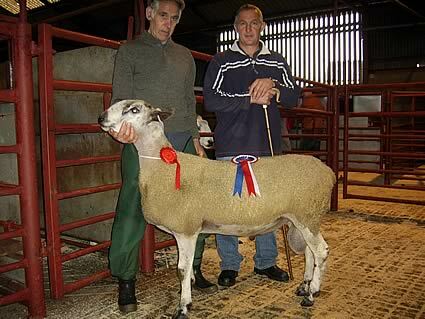 Ram lamb:- 1st Prize – R.J. & D.G. Telford, Hole of Lyne. 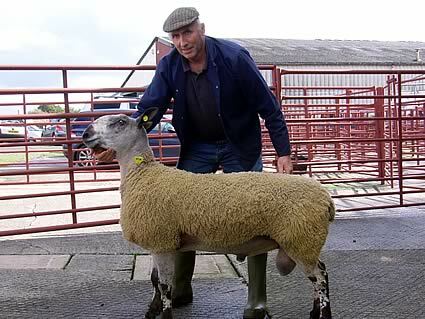 The days top price and a breed record price for the centre was the shearling shown by A.R. Carruthers, Peela Hill, Bewcastle which sold at £3,400 to Messrs Charlton, Whiteside, Gilsland. Shearlings - £3,400 Peela Hill, £900 (x2), £650 The Side, £620 Bellmount, £520 Albierigg and Parkhill, £500 Shielsknowe, Sewing Shields and Peela Hill. Ram lambs - £350 Parcelstown and Hole of Lyne, £290 Troutbeck Cottage, £280 Parkhead and Hole of Lyne, £260 Parcelstown, £240 Penpeugh. The Bluefaced Leicester females met a very sticky demand and were difficult to cash. Ewes to £98 and £90 Riggshield, £62 and £62 Harden. Ewe lambs to £62 and £60 Collinbank.